On weekday mornings and afternoons people in east Maple Ridge may have had a chance to see Steve Schleicher in his bright yellow velomobile, on his way to or from work. 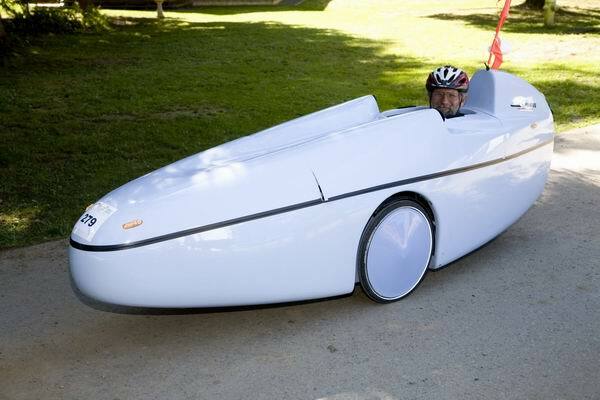 When I mention the word "velomobile", most people always look at me, wondering: "what on earth is a velomobile?". It's a tricycle, either with two wheels in front, or two wheels in back, with a cover. The cover provides streamlining, which helps it go faster, at least when the terrain is flat or downhill - when you go uphill it's a bit slower than a regular bike - and it also helps to keep yourself dry when it rains. Steve is the owner of Velomobiles.ca, a business close to where the Albion Ferry used to be. This is where he has been designing these pedal-powered, sleek-looking vehicles. Check out Steve's blog. Before the economic downturn, business was pretty good for Steve, who also makes kayaks. In recent years he's had to downsize, like so many other companies. He's been in Albion for quite a few years, but not for that much longer. Steve and his wife Jan recently moved to Quadra Island, the lucky stinker, and one of these days he'll move the business to Quadra too. I hope he'll come back once in a while to visit, and bring his velomobile too. It's always been a great draw for us at local events. I've had a chance to ride one back to his shop after GETI Fest in September. It wasn't a very long ride, and I thought it wasn't worth the trouble to adjust the velo to my smaller frame. I quickly found out that I should have, because I couldn't really see much in the mirror without stretching way back. Anyway, it was fun! You don't see too many velomobiles around here. Steve's velos are the only ones I've seen. As a matter of fact, his are the only velomobiles I've ever seen in my life, apart from photos. After I met Steve several years ago, and googled "velomobiles", I found out that actually in the Netherlands, where I come from, velomobiles are a very common sight these days. That makes me think of an excellent blogger in Holland, who's originally from England, who writes about them too occasionally. He happens to work in a velomobile workshop as well. His name is David Hembrow, and his blog, A View from the Cycle Path, is an excellent source of very interesting, well researched cycling related information. His blog explains why we should all be paying attention to the Dutch examples and expertise when we try to make cycling a more appealing mode of transportation to people of all ages and abilities in our part of the world. Apart from writing on his blog and making velomobiles, he also organizes cycling tours for foreign politicians and planners to show them how things are done in the Netherlands, and to explain to them what it is that the Dutch have done to make cycling so popular. It's not true that the only reason people cycle so much in Holland is just because it's part of their culture. Most Dutch people would cycle a whole lot less if they would move to Maple Ridge, you can believe me! A couple years ago I sent David a photo that I took in Maple Ridge of what was considered an "acceptable bike route". He then used that photo for this blog post on "subjective safety". You can probably guess which road it is. A rather dubious honour for Maple Ridge to be used as a bad example! I wish some of our politicians and planners could take a cycling trip with David. They'd come back converted, that's for sure! Going back to velomobiles, here's a great article that a.o. explains the efficiency of velomobiles.